The Lok Satta Party today condemned concerted and malicious attempts at distorting its views on formation of Telangana as a separate State. 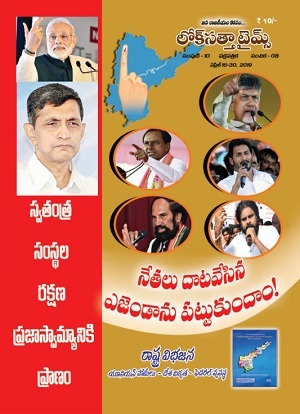 In a media statement, Lok Satta Party General Secretary Katari Srinivasa Rao referred to the report in a newspaper which sought to portray the Lok Satta Party as opposed to the bifurcation of the State. The Lok Satta, pointed out Mr. Srinivasa Rao, believes that the recent by-elections to the Assembly merely confirmed Telangana people's long and ardent desire for a separate State. The party has, therefore repeatedly sought an early solution to the issue. The Lok Satta Party whole-heartedly welcomes formation of Telangana as part of a comprehensive and amicable solution to the problem. Lok Satta Party national President Dr. Jayaprakash Narayan attempted to elucidate his party's view during the discussion in the Assembly on September 18. In that context, he reiterated the party view that activities like bandhs that disrupt normal life will harm the State's economy and hurt the interests of youth. Going on economic disruptive activities is tantamount to cutting the nose to spite the face. Mr. Srinivasa Rao underlined that Dr. JP did not utter a word against Telangana and on the contrary sought an early solution. But he sharply criticized observance of bandhs in the name of Telangana. Although Dr. JP drew a distinction between the demand for Telangana and calls for bandhs etc, his detractors clubbed the two and alleged that the Lok Satta is opposed to Telangana. Mr. Srinivasa Rao recalled that the Lok Satta is opposed to bandhs right from its inception since they inconvenience people. Without allowing Dr. JP to complete the speech, his detractors sought to put words in his mouth and a responsible newspaper carried a speculative report. Dr. JP spoke just one sentence on the inconvenience caused to IBM because of the bandh. People are fully aware of the loss caused to the State because of frequent bandhs. 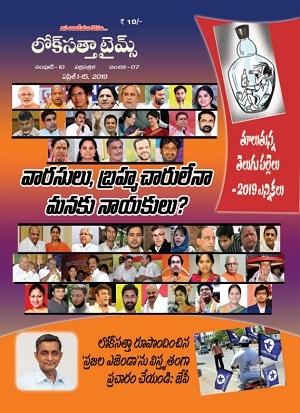 The Lok Satta believes that opportunistic policies of both the Congress and the Opposition TDP are responsible for turning the Telangana problem into a crisis and driving hundreds of people to suicide. The Union Government's inaction even 20 months after the Srikrishna Committee submitted its report borders on irresponsibility. Ok, got it. So, you demand a quick solution. But the important question you did not answer is this..
"what solution do you favor"? Creating the state or beating round the bush like you have done in this article. I would like to re iterate what JP said in assembly, " He said around 60 employees of IBM are moving to Bengaluru daily, projects are affected due to T agitation." Where as the higher authorities of IBM have clearly declined those comments. If you firmly believe what JP said is correct, why don't you go ahead and prove it? Firstly LSP and its leader make false allegations against T movement and moreover are trying to cover it up with lame excuses. Abhinay, like many people who came into this movement under KCR's leadership, you have no clue whether you are going or coming. Bandhs have to have an effect. They have to hurt. If they dont have an effect, if they dont hurt anyone, then Bandhs are just holidays for lazy and corrupt employees. What JP said is tantamount to saying that the Bandh is effective. It is hurting. IBM employees are leaving. Manufacturing industry is losing production. Overall, the economy is taking a beating. If you want proof of that, then you must be believing that the bandh is not hurting anyone. If that is what you are believing then clearly, you are supporting a bunch of corrupt and lazy government employees who are taking a holiday in the name of Telangana and after the bandh increasing the amount of bribes they are taking. I suggest that you stop challenging JP and go out and celebrate the fact that the IBM employees are leaving. It just means that the bandh has had the effect it was supposed to have. Do you really think IBM will publicly admit about shifting its projects? If you are running a business in Hyderabad, will you openly dare to express this? Get real. @S pagadala. JP already said that if T resolution is passed in assembly LS will support it. If someone is deaf, everyone can not come and shout to get that known to that person.